Our "Q & A Interview" is with Scott, from Tempe, Arizona. Our next �Q & A Interview� is with Irada�s husband Scott. Scott is 34 years old, he works as a Project manager. 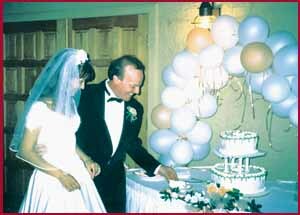 On the 10th of July of 1999 Irada and Scott got married. Our congratulations to the Newlyweds! Scott, please tell us, how did you decide to look for your life-time partner on the Internet, through a company like ours? Although I was very satisfied with my professional career, my social life was nearly non-existent and I felt that I would never meet the right woman for marriage. I never gave much thought to companies like A Foreign Affair until my father found your website on the Internet and suggested that I take a look. I was pessimistic about my prospects for success at first, but eventually I decided to give it a try. I figured that I had little to lose, and it would be quite an adventure if I was successful. In addition to A Foreign Affair, I looked at a few other companies like �Scanna� and �European Connections.� Before I placed an order with any of these firms, I decided to call each one and speak with their staff members. A Foreign Affair impressed me with their level of professionalism, courtesy and enthusiasm, that was unmatched by the other companies. I also liked the fact that the company�s owners personally escorted the tours to Russia. I started out with letter writing, but I quickly realized that I needed to go to Russia to personally meet the ladies exchanging correspondence with me. After six months of writing letters, I elected to go on one of A Foreign Affair�s tours. Irada and I first met quite by accident at a local restaurant in the center of St. Petersburg. While each of us were having dinner with a different group of friends, we introduced ourselves and chatted for a while and took a few group photos, I didn�t see her again until I bumped into her at one of A Foreign Affair�s socials. She was just adorable! She had a beautiful infectious smile that stretched from ear-to-ear and she seemed so happy and friendly. I felt so happy just being near her. After I returned home from Russia, we began to exchange letters. A few months later, I returned to St. Petersburg to visit her again. We spent each day together getting to know each other. When my vacation came to an end and I returned home, I wrote many letters and called her often, but it wasn�t a good substitute for being with her. Seven weeks later, I met her in Helsinki, Finland for a few days to tell her that I wanted to spend the rest of my life with her. She graciously accepted my proposal of marriage and we began the Fiancee Visa process soon after. Do you feel like you placed an order for your wife? (�mail order bride�)? Not at all. A Foreign Affair provided me the opportunity to meet someone that I would otherwise not have had a chance to meet. There is nothing �Mail-Order� about the experience or their service. I feel my life is now complete. I am very happy that I have someone with whom to share my life. We have many dreams, desires and ambitions for our future together. Our first priorities will be to get adjusted to married life and for Irada to become adjusted to life in America. During her first few weeks here, she felt very out of place and homesick. Little by little though, she is becoming more comfortable with daily life in America. We both wish to start a family together and have children within a few years. Have you met her family? How do they feel about your marriage? Yes, I met her family when I visited Irada in Russia. Her mother even attended our Wedding in Arizona. I flew her mother to America so she could participate in our wedding. Her mother says she is very happy for her daughter. How do your friends feel about your new wife and about participating in the service themselves? Excluding my father, who suggested A Foreign Affair in the first place and a few good friends who have had a similar experience, most friends and acquaintances of mine had a healthy level of skepticism about the whole process at the outset. It was only after she arrived in America and they had an opportunity to meet her and see us together, that they changed their opinions. I guess this is a case where �The proof is in the pudding!� Now, some of my skeptical friends have decided themselves to give A Foreign Affair a try. What would you say to any man considering using our service now? I highly recommend the services of A Foreign Affair. JUST DO IT! You have almost nothing to lose and so much to gain. At least, you get to experience the adventure of a lifetime. If you succeed, you can achieve the dreams of a lifetime.